You can add any number of water Canal Tiles to your Base Urban Set, to form a canal system in your city!. You have to pre-order a Base Set before adding any more tiles and/or base sets in your order. Canal Tiles come in 6 different designs to allow variable configurations and expansions. All three harbour designs are available in "Contemporary" (more suitable for "Modern" sets) and "Medieval" Themes. As the docks are artificial, there are none with the texture of the Rustic "dirt". However, the medieval themed canals will look fine when combined with the "Rustic" theme. 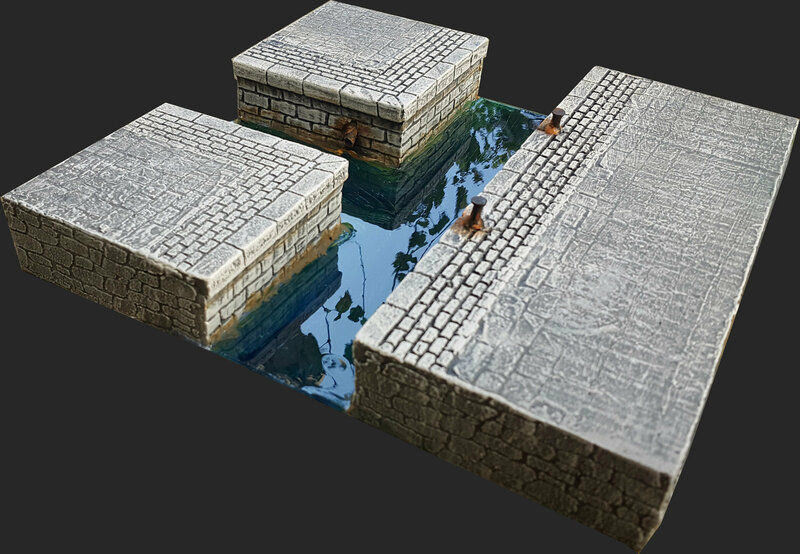 These 30cm x 30cm (1'x1') Tiles can be combined to recreate a city canal system. Canal tiles represent mostly urban "river" areas, and they enclose the water with Quays on either side. The Urban parts are raised at 4cm, and the water runs from the middle of the tile's edge, at 7cm width and 1mm height. Owners of our standard Pedion River tiles will recognise the design concept. The "urban" sides of each tile depicts the pattern from either "Medieval" or "Modern" themes. The water portion is treated with an awesome liquid glass finish. Since our regular urban tile's height is at 1cm, there is a 3cm height difference meant to emphasise the vertical sides of the canals. You can "join" the canal tiles with your regular tiles just by adding some of our resin stairs. However, more raised tiles and/or sloped roads (by making use of the Urban Rises & Slopes Elevation System) will produce more interesting layouts, especially if combine with road overpasses and bridges. The sixth design (canal harbour exit) allows you to let your canals meet the sea. The Road overpass will include a road like the rest of your Set. You can use our Medieval Stone or Modern Bridges to place over the Canal, which are designed to fit the "Road overpass" tile. If you play many games of Frostgrave (the excellent Skirmish game), or if you just enjoy the coolness of the Frozen City look, then this new Upgrade is for you: you can update any (or all) of the tiles in your Medieval Set to look weather-beaten from snow storms. This option is available only for Medieval themed Canal Tiles. We treat the tiles with flock and resin, so that they get a white dusting, snow drifts and frozen ice pools on the streets. Also, there will be ice chunks floating on the cold water. Please note that the Frozen City treatment is not removable - it will change the look of your medieval tiles permanently. You have the option of adding extra, scale-specific roadlines on your "modern" themed roads in Road Overpasses. For ease of play and less scale dependency, "modern" themed roads come only with white sidelines painted on them. You can order your road tiles at 14cm width instead of the standard 7cm width in Road Overpasses. This is something many people gaming exclusively in 28mm scale have asked for, a road width closer to real modern day roads. This option is available only for "Modern" themed tiles and reward sets, i.e. to asphalt roads. A road width of 14cm corresponds to a double-lane street (real world width of approximately 7.85 meters or 24 feet). There is no extra charge involved with this option: you will simply state whether you like your "Modern" themed tiles in 7cm or 14 cm width. Keep in mind though that it would be wise to add some extra road lines (see above) to properly delimit the two lanes.